E3 Consulting held a Property Taxation Update at Athelhampton House on Tuesday 28th November. 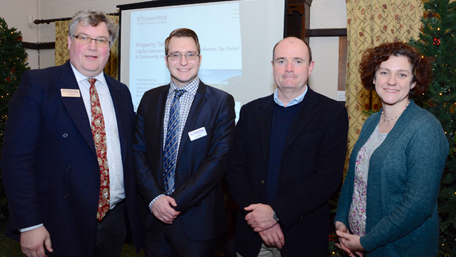 E3 Consulting held a Property Taxation Update at Athelhampton House on Tuesday 28th November. The Seminar covered Capital Allowances, VAT, Community Infrastructure Levy and Land Remediation Tax Relief. It was an opportunity to inform our current clients, professional advisors and new contacts interested in understanding more about how they could reduce the cost of their property projects. We were pleased to have a ‘full house’ in attendance from a wide range of businesses across the Wessex region including architects, solicitors, wealth managers, surveyors and other property professionals alongside property developers, investors and business owners. Our four speakers, included Alun Oliver, Managing Director; Ian Barwick, Property Tax Surveyor and Sarah Kay, Real Estate VAT Consultant from E3 Consulting and guest speaker James Brooke-Webb, Director at Stay Original Co. James provided a practical insight to his perspective as a longstanding client of E3 Consulting – highlighting the multimillion pound savings his business has benefitted from. The talks focused upon giving practical guidance through looking at a variety of real life case studies, drawn from E3 Consulting’s experience. Managing Director Alun Oliver, focused on Capital Allowances and Land Remediation Tax Relief, highlighting a number of areas where E3 Consulting has saved significant sums of money for clients. Alun gave a particular focus on the refurbishment of existing properties with EPC ratings F and G, to support landlords in complying with the Minimum Energy Efficiency Standards (MEES) regulations and the April 2018 deadline for being able to grant new leases on those properties. He explained that energy and water efficient technologies can achieve 100% tax relief where they meet the Enhanced Capital Allowances criteria, giving landlords a significant tax saving which can offset refurbishment costs. Alun once again emphasised the importance of considering capital allowances at the point of sale or purchase of a property, particularly when the New Fixtures Rules apply. To highlight this he discussed a case study involving the purchase of five distribution centres for £65million, for which E3 were appointed to undertake the due diligence. The properties each had complicated ownership histories, with some being subject to prior claims and s.198 elections. E3 Consulting was able to produce comprehensive due diligence reports within 48 hours, so that the transaction could go ahead within the planned time frame. E3 Consulting identified further opportunities to optimise the client’s capital allowances position, and we were then appointed to provide detailed claim reports, resulting in total tax savings for the client of over £7million. James Brooke-Webb – Stay Original Co. Guest speaker James Brooke-Webb talked about his longstanding relationship with E3 Consulting and the wide variety of property investment and pub/restaurant projects that E3 Consulting had worked on over the years. He was very complimentary about the responsiveness, proactive dialogue and proven expertise of Alun and the E3 Consulting team. “Making full use of our available capital allowances has really helped our tax planning and supported the growth of our pub and hotel business.” James Brooke-Webb, Stay Original Co.
Real Estate VAT Consultant, Sarah Kay, discussed VAT issues relating to both commercial and residential property, highlighting one recent case study where a small developer client had constructed new houses from scratch although they had not understood the subtle differences between zero rated and being VAT exempt. He could have registered for VAT several years ago and recovered input tax on his costs. Sarah highlighted how E3 Consulting was able to arrange a back dated VAT registration, assist with compiling the first VAT return and liaise with HMRC to review the claim. In total this allowed the client to claim back over £140,000 on their first VAT return. Property Taxation Surveyor, Ian Barwick, spoke about the CIL regime and the opportunities for mitigation. He highlighted some of the common mistakes that developers and owners make when looking at CIL, as well as some of the examples where E3 Consulting has been able to help and add significant value. This included advising an owner on the self-build reliefs which were available in respect to their project, enabling them to reduce their CIL liability from over £350,000 to nil! One of the key messages, from each of the speakers was the benefit of timeliness and receiving specialist advice early on, whether that be prior to purchase, sale, valuation of a business and/or decision to invest in a project, whether new build or for refurbishment; in order to minimise potential issues further down the line. This ensures clients and their advisers are better able to optimise the available tax reliefs and avoid expensive pitfalls. Getting advice early is also about managing risk and giving piece of mind so that clients know they are being proactively supported from a tax perspective. E3 Consulting regularly hosts Property Tax Update seminars and workshops across the UK and will be holding a number of talks in 2018. Whilst dates and venues are yet to be confirmed, these will include seminars and a small number of roundtables in London across the South East, South West and further afield. If you are interested in receiving information about future dates please register your interest here.